President Buhari decorates the new Inspector General of Police, Mr Mohammad Adamu at the State House Abuja. 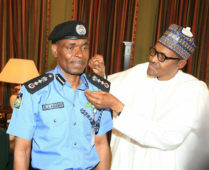 President Buhari decorates the new Inspector General of Police, Mr Mohammad Adamu assisted by the outgoing, Alh Ibrahim Idris at the State House Abuja. 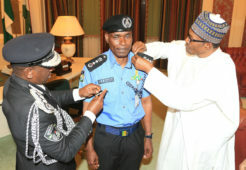 President Buhari decorates the new IG Mohammad Adamu at the State House Abuja.